The Northern Mystics are a New Zealand netball team based in Auckland that currently compete in the trans-Tasman ANZ Championship. The franchise was formed in 2007 as an amalgamation of two teams from the National Bank Cup – the Northern Force and the Auckland Diamonds – after the competition was retired that year. In 2008, the Mystics joined four other New Zealand franchises in the new ANZ Championship, representing the New Zealand regions of Northland and Auckland. Home games in the ANZ Championship are usually played at Temepara George, who has led them in every match since the start of their inaugural season. In four seasons of the ANZ Championship, the Mystics have continually made widespread changes to their playing roster and coaching staff. Their first three years have seen the Auckland-based side finished no higher than sixth, although an international-laden lineup saw improved performances in 2010. The Mystics had their most successful season in 2011, qualifying for their first finals and earning a spot in the grand final, before finishing runners up to the Queensland Firebirds. The ANZ Championship was founded in 2007 as the new elite domestic netball competition in New Zealand and Australia. It replaced the National Bank Cup in New Zealand and the Commonwealth Bank Trophy in Australia, which both played their final season in 2007. When the new trans-Tasman competition was announced, the competition was reported to feature five teams from each country. For the new competition, five New Zealand franchises were formed from amalgamations of National Bank Cup teams. A franchise based in Auckland was proposed early in the selection process. The five New Zealand franchises were finalised and approved in May 2007, including one representing the northern regions of Northland and Auckland, formed as an amalgamation of the Northern Force and Auckland Diamonds from the National Bank Cup. The new northern franchise started interviewing coaches in August 2007 for the inaugural season in 2008. As of September 2007, Yvonne Willering, who had previously coached the Northern Force, had been confirmed as the coach for the new northern franchise. The name of the franchise had been confirmed by December that year as the "Northern Mystics"; the team signed LG Electronics as its naming sponsor, officially becoming the LG Northern Mystics. Player selection for New Zealand franchises was delayed due to ongoing negotiations between the New Zealand Players Association and Netball New Zealand. The dispute over import players was a particular problem for the Mystics, since both the Northern Force and Auckland Diamonds had considerable numbers of Pacific Islander players. The negotiations were settled on 22 December, allowing New Zealand franchises to start formally signing players. The Mystics started the inaugural season with a 44–48 loss at home to the Canterbury Tactix. They played 13 games throughout the season, finishing seventh overall with a 5–8 win-loss record. After a disappointing first season, the club axed Willering as head coach and appointed as her replacement former assistant coach Te Aroha Keenan for the next season. The Mystics squad for the second season was published by Netball New Zealand on 5 November 2008. However, the Mystics squad list was contingent on Cathrine Latu receiving international clearance, and former Silver Fern and Fijian coach Vilimaina Davu being approved for New Zealand citizenship; Pamela Cookey, a shooter in the England national team, is the other import player for the Mystics. With a longer preseason for the 2009 competition, the Mystics enlisted New Zealand rugby sevens coach Gordon Tietjens to help with fitness training, which was credited with helping the Mystics to go through a pre-season tournament in Queenstown undefeated. Nevertheless, the 2009 season proved disappointing for the Mystics who finished in 8th place, one spot lower than in the previous season. For the 2010 season, the Mystics squad had the most changes of any ANZ Championship team, with only four players from last years squad Temepara George, Grace Rasmussen, Finau Pulu and Cathrine Latu. The Mystics gained Silver Ferns stalwarts Maria Tutaia and Joline Henry from the Waikato Bay of Plenty Magic, as well as Althea Byfield (Jamaican international) from the Central Pulse and Jenny-May Coffin from retirement. The 2010 season was the Mystics' best finish in their short history, finishing at sixth place. While this was an improvement on previous seasons, it was below what many commentators had predicted for the international-laden lineup. Some notable wins include their first ever victory over an Australian team, the Adelaide Thunderbirds, and another nail-biting win against the Central Pulse, where the match tied after regulation time and was won by one goal after extra time (the same score as in last year). The Mystics were no longer have the worst record against the Australian teams after winning against the Thunderbirds in round 1 and the Fever in round 12. This means the Pulse are officially the New Zealand team with the worst record against the Australian teams. The coaching staff of the Mystics was changed with head coach Te Aroha Keenan stepping down and last year's assistant coach Debbie Fuller taking over. In addition, Jenny-May Coffin stepped up from her playing role to take the position of assistant coach for the Mystics. The Mystics have also successfully gained Silver Fern defender Anna Harrison (née Scarlett) from volleyball, and in a major coup signed Megan Dehn after her attempts at gaining New Zealand residency for the Southern Steel were unsuccessful. In rounds five and six, coach Debbie Fuller was due to have a baby. As a result, assistant coach Jenny May Coffin became head coach for the Mystics during that time. After the round-robin matches the Mystics finished in 4th place, qualifying for their first finals series. The Auckland team headed to Sydney to face the New South Wales Swifts in the minor semi-final, defeating the hosts in an upset victory. A second victory against the Waikato Bay of Plenty Magic earned the Mystics a place in the 2011 grand final against the Queensland Firebirds in Brisbane. The undefeated Firebirds claimed victory on home soil and their first ANZ Championship, defeating the Mystics by 57–44. 2012 saw few changes to the Mystics line-up. Import Megan Dehn retired from playing, and joined the coaching staff as a specialist coach for all Trans-Tasman games. She was replaced by English captain Jade Clarke. Ex Canterbury Tactix defender Charlotte Kight was signed to cover the loss of international player, Joline Henry, who left to join the Central Pulse. 2011 temporary replacement player Portia Woodman was also signed. Gail Parata joined the franchise as an assistant coach. After an up and down round robin, the Northern Mystics finished second on the table, but lost the major semi final, and the preliminary final, to finish in 3rd position overall. In round 8 the beat the Melbourne Vixens to pick up just their third win on Australian soil. During that game they unveiled the infamous Harrison Hoist. The Mystics have made several changes to the roster for the 2013 season, most notable being the signing of ex Jade Clarke, as well as Auckland veteran Rachel Rasmussen to the Southern Steel. Several young development players have been signed in their place. The Mystics made some quite successful to their 2013 lineup with the club signing form Waikato Bay of Plenty Magic captain and current Silver Ferns vice-captain Laura Langman to the center court. From the Waikato Bay of Plenty Magic they also signed Nadia Loveday and Jodi Tod-Elliot. The changes worked for the side moving from 10th place on the 2013 ladder up to 7th place on the 2014 ladder. 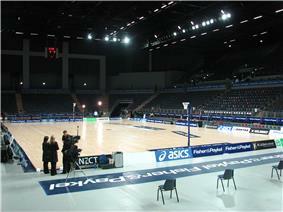 Vector Arena configured for netball. The Mystics play their home games at three venues in Auckland. Most home games are played at the Trusts Stadium in Waitakere, which has a maximum capacity of 4,901. It was also the host venue of the 2007 Netball World Championships. Other matches are also held at the North Shore Events Centre – which has a maximum capacity of less than 5,000 – and at Vector Arena, the largest indoor sports arena in New Zealand, with a capacity of over 12,000. ^ Bull, Alastair (2007-03-12). "Ten-team trans-Tasman netball league revealed". The New Zealand Herald. Retrieved 2008-04-03. ^ NZPA (2007-05-09). "Nod to all five Tasman Trophy bids". The New Zealand Herald. Retrieved 2008-04-03. ^ Marshall, Jane (2007-08-15). "Hands-off pact by new franchises". The Press. Retrieved 2009-02-19. ^ Marshall, Jane (2008-09-27). "Second tier players can star". The Press. Retrieved 2009-02-19. ^ "Get ready for the something mystical from the North" (Press release). LG Electronics. 2007-12-07. Retrieved 2009-02-14. ^ NZ City, NewstalkZB (2008-12-12). "Waiting game continues for Tasman comp". NZ City. Retrieved 2009-02-26. ^ Marshall, Jane (2007-12-13). "Vagana slams import rule". The Press. Retrieved 2009-02-19. ^ "Netball Agreement Finalised For ANZ Championship" (Press release). Netball New Zealand. 2007-12-22. Retrieved 2009-02-26. ^ "Decision expected Monday on final Mystics player". NewstalkZB. 2008-02-01. Retrieved 2009-02-26. ^ a b Johannsen, Dana (2008-03-19). "Mystics get approval to sign Davu". The New Zealand Herald. Retrieved 2009-02-26. ^ Johannsen, Dana (2007-12-14). "George opening Mystics' gambit". The New Zealand Herald. Retrieved 2007-12-22. ^ "Keenan appointed Mystics coach". FOX Sports. 2008-09-26. Retrieved 2008-09-28. ^ a b NZPA (2008-11-05). "Squads announced on Wednesday for next year's transtasman netball league". tvnz.co.nz. ^ Johannsen, Dana (2008-12-22). "Mystics enlist for fitness boot camp". The New Zealand Herald. Retrieved 2009-02-26. ^ Johannsen, Dana (2009-02-23). "Hard work pays off for unbeaten Mystics". The New Zealand Herald. Retrieved 2009-02-24. ^ a b Johannsen, Dana (2010-07-13). "Fuller waits in the wings for Mystics". ^ Newstalk ZB; ONE Sport (2010-08-17). "Coffin jumps from player to coach". TVNZ. Retrieved 2010-11-13. ^ Napier, Liam (2010-09-17). "Dehn in, Byfield out". Sportal.co.nz. Retrieved 2010-11-13. ^ "The Trusts Stadium: Main Arena". Retrieved 2009-02-26. ^ "North Shore Events Centre: Facility Info". Retrieved 2009-02-26. ^ "Vector Arena: Facts & Facilities". Retrieved 2009-02-26.